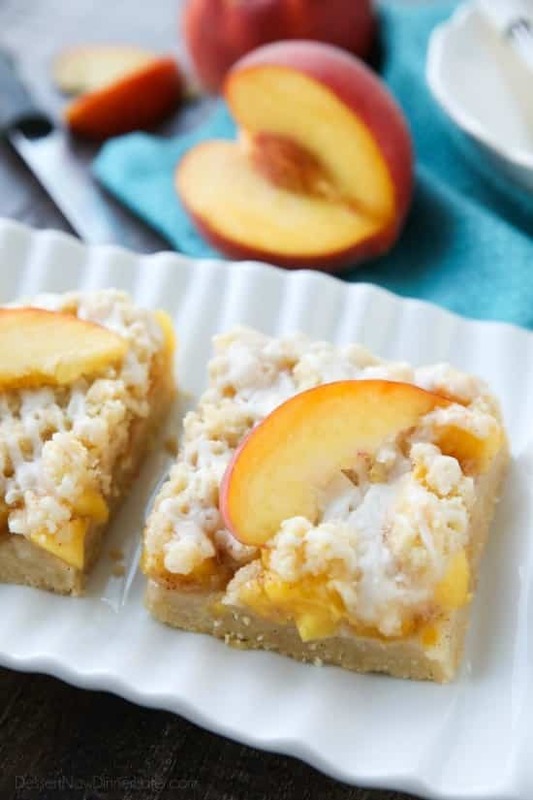 Peach Crumb Bars - Dessert Now, Dinner Later! 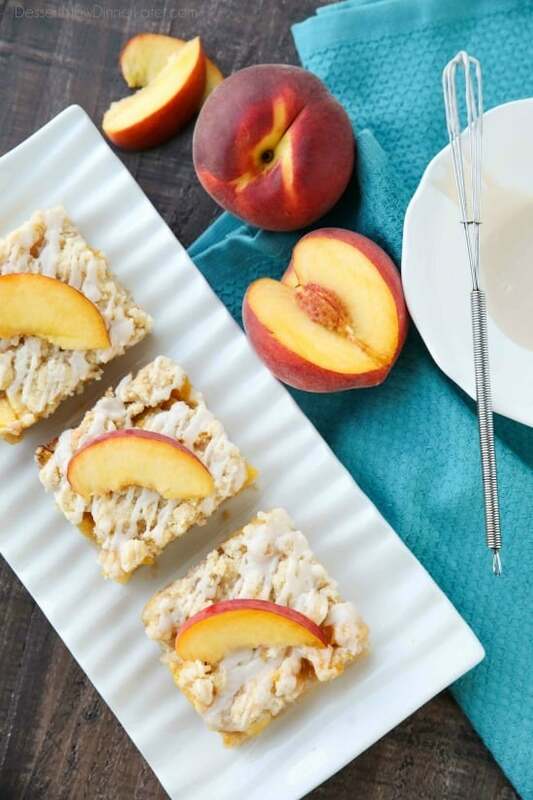 These Peach Crumb Bars are made with fresh summer peaches, sandwiched between a sweet buttery crust and crumb topping, with a hint of cinnamon, and are drizzled with a fresh almond (or vanilla) glaze. 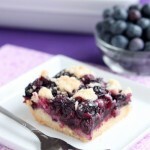 The most delicious summer dessert! *This post is brought to you by Smith’s (a Kroger store). Thanks for supporting the brands that make Dessert Now Dinner Later possible. How is it that summer is half over already?! I’m dying to savor every bright, beautiful day, and every fresh grown produce that summer has to offer. 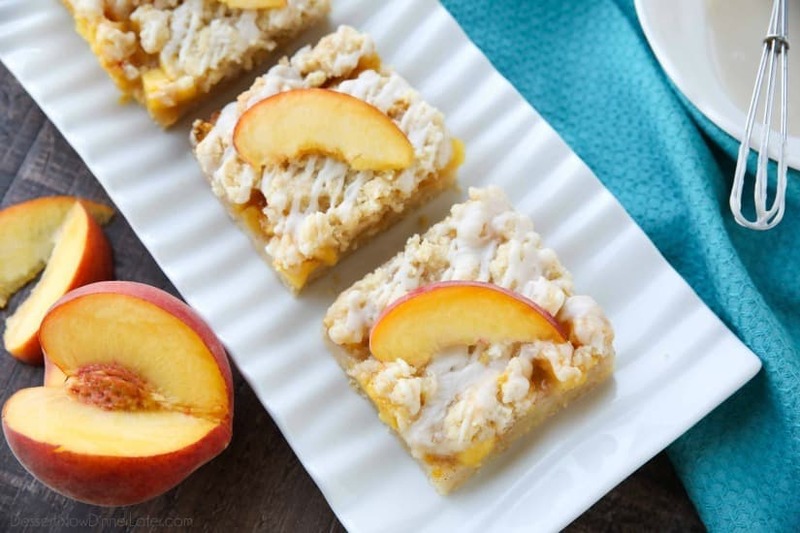 And these Peach Crumb Bars are the way to go! In Utah, the peach trees are almost ready to harvest. We actually live close enough to attend the Brigham City’s Peach Days Festival every September. It’s always something we look forward to. We always get the peach cobbler, and sometimes even a fresh peach pie! 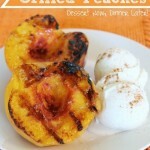 Peaches are one of my favorite fruits, especially in desserts. Even though the peaches aren’t quite available locally, the prices are going down in the stores, so I’m taking advantage of it because I’ve been dying to make a peach dessert. One of my favorite places to grocery shop is at Smith’s (a Kroger store) because they have the best fresh produce. Smith’s also has two great lines of high-quality products that I look for while I’m shopping: Simple Truth Organic, and Private Selection. I know when I reach for those products that my food will taste even better. 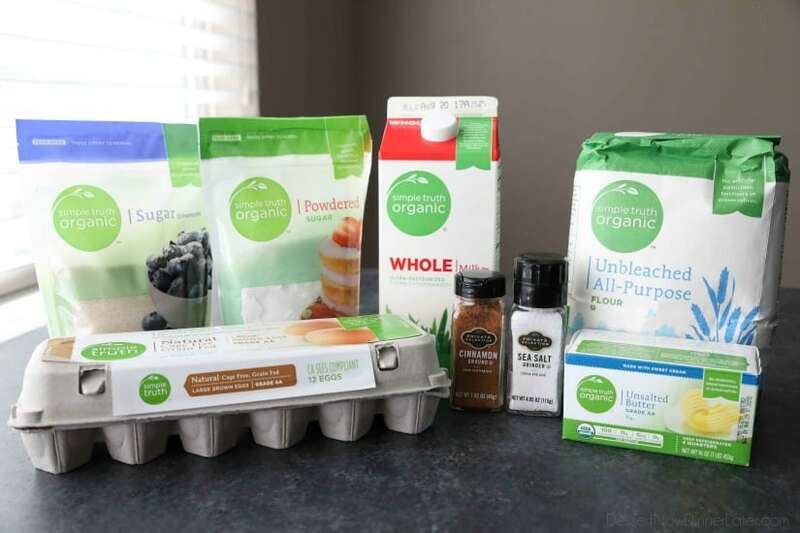 I used all of these products (pictured below) in today’s recipe. 2. Reserve a time slot to receive your groceries. I’m already clicking around the ClickList website in anticipation, and if you click on “Start My List”, you will see things you have purchased in the past linked from your Fresh Values Savings Card. LOVE that feature because it’s going to make online grocery shopping a cinch! FYI: I will doing a Facebook LIVE video about ClickList next month when it’s available at my store, so stay tuned for that! (Make sure you have liked my page.) There will be special prizes to giveaway too! Let’s get back to today’s recipe. 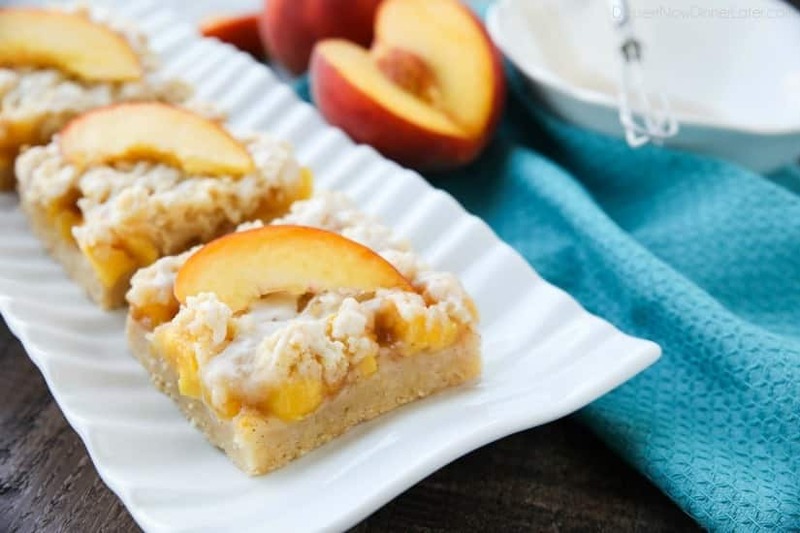 I’ve made Blueberry Crumb Bars, Strawberries & Cream Crumb Bars, and a few others in the past, but these Peach Crumb Bars are ridiculously delicious too. I don’t think I can pick a favorite. 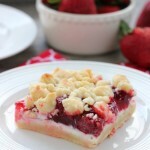 Basically, I’d eat all the fruit crumb bars! You’re going to love this recipe! 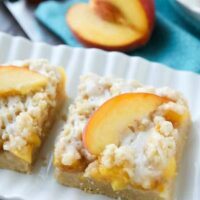 The glaze on top makes these bars even better! I can’t wait to make them again! Preheat oven to 375 degrees Fahrenheit. Lightly grease a 9x13-inch baking dish. FOR THE CRUST/TOPPING: In a medium bowl, whisk together the flour, sugar, baking powder, salt, and cinnamon. Use a fork or pastry blender to cut in the butter until mixture resembles coarse sand. Add the egg and mix with hands until dough starts to hold together, but is still crumbly. Press 2/3 of the mixture onto the bottom of the prepared baking dish. Save the other 1/3 for later. Bake for 45 to 50 minutes or until lightly golden brown on top and bubbling in the center. Cool completely. FOR THE GLAZE: Whisk ingredients together in a small bowl, adding milk a little at a time until desired consistency is reached. Drizzle over cooled bars. Cut and serve. Keep covered and store at room temperature. These look so summery and delicious! 😍 I can’t wait to try them! I had just picked up some fresh peaches and made these. They are delicious! That makes me so happy! I’m glad you got to try them and that you liked them!